An endangered cassowary roams in the Daintree National Forest, Australia, June 30, 2015. 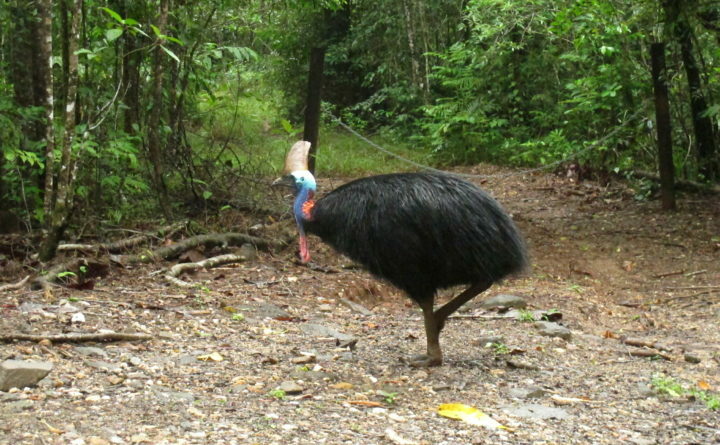 On Friday, a cassowary, a large, flightless bird native to Australia and New Guinea, killed its owner when it attacked him after he fell on his property near Gainesville, Florida. Cassowaries are similar to emus and stand up to 6 feet tall and weigh up to 130 pounds. MIAMI — A captive cassowary, the large flightless animal considered the most dangerous of birds, killed a man Friday near Gainesville, Florida. The man, whose name was not released, had sustained “serious injuries” and was transported to a local hospital, Alachua County Fire Rescue Deputy Chief Jeff Taylor said in an email. He later died. Cassowary diets consist exclusively of fruit, but each of the birds’ three-toed feet hides a “daggerlike” claw on the inner toe that can grow up to 4 inches long, according to information published online by the San Diego Zoo. The birds are native to New Guinea and parts of Australia. A cassowary can also jump seven feet into the air and run up to 31 mph.